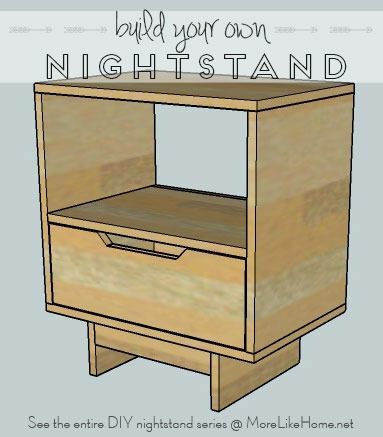 I can't believe we're on day fourteen of our nightstand series already! You can check out the entire series here. Today's plan is simple yet super versatile. 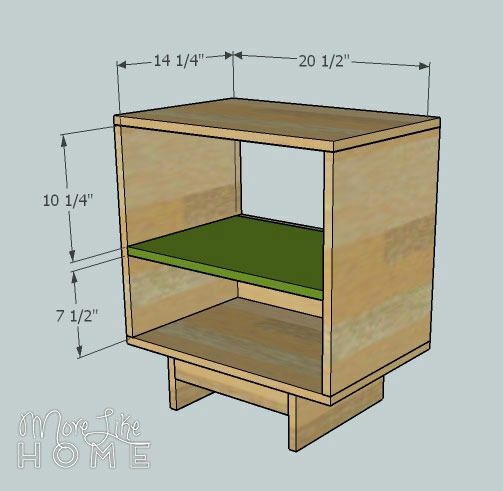 It features a drawer on bottom with a cubby space on top, but we'll be looking at a few ways to customize it and make it your own. It also works great as a living room end table! 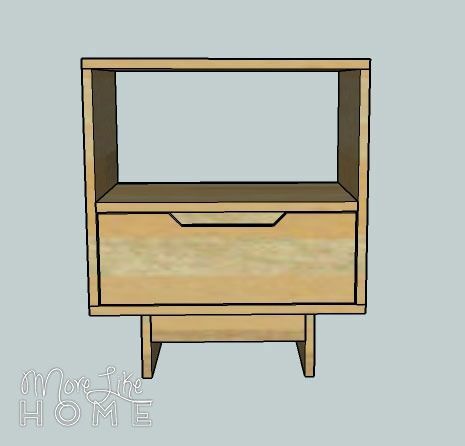 This plan was inspired by several nightstands and there are simple changes you can make to change the style! 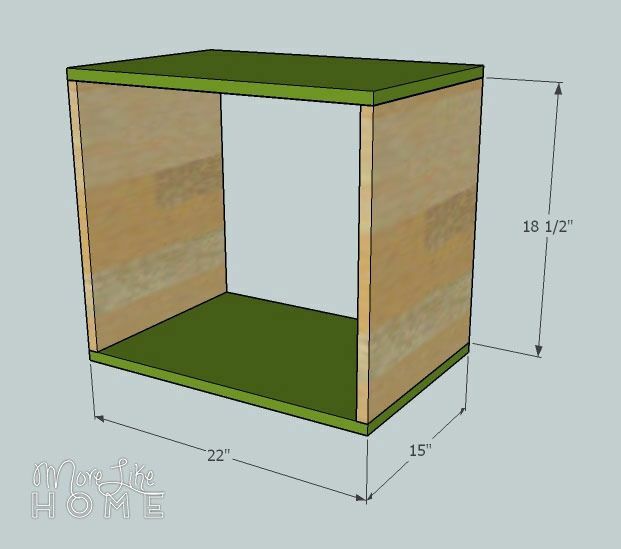 The plans lean on this design for proportions and a notched drawer pull. 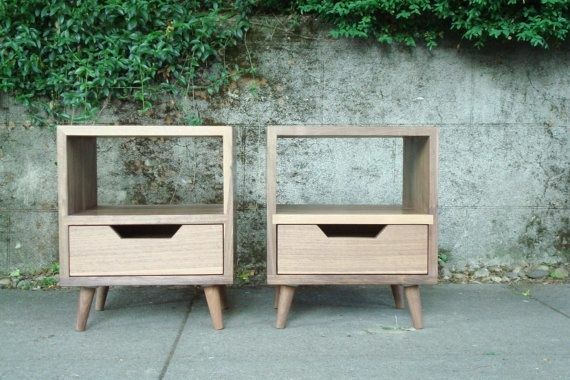 You can swap out our base for a set of tapered legs to get a mid century modern vibe. 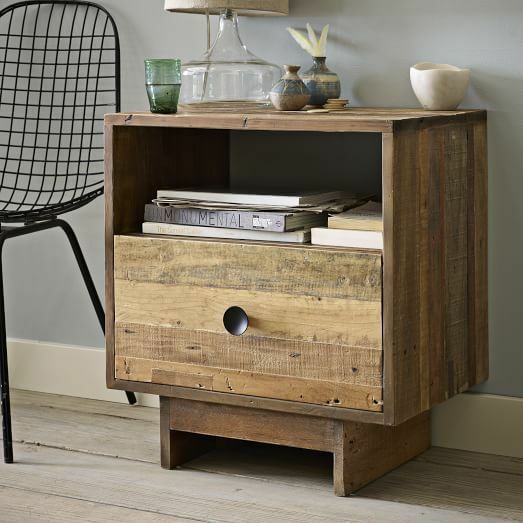 Our base is inspired by this similar design from West Elm. It's easy to build and requires standard dimensional lumber that is readily available at your hardware store. 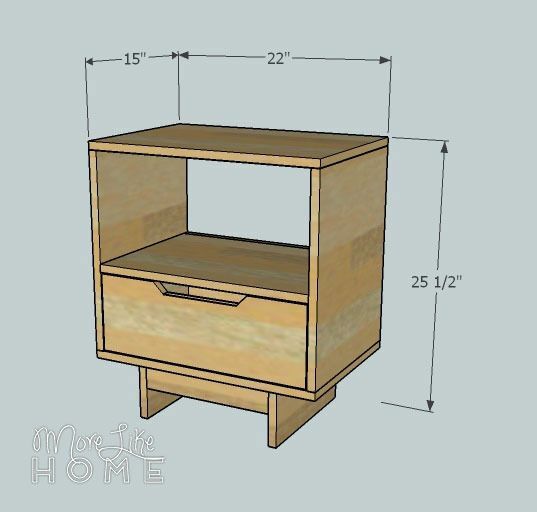 If you prefer these proportions, you can just make your drawer box taller! But wait, there's more! At the end of the plans we'll also give you the option to do a two-drawer look that's more along these lines. You'll have to make your table a little more tall and narrow to match the proportions of this inspiration piece. But enough chit chat. Let's get to the plans! Remember to always double check your measurements before you cut. Use 1 1/4" screws unless otherwise indicated. 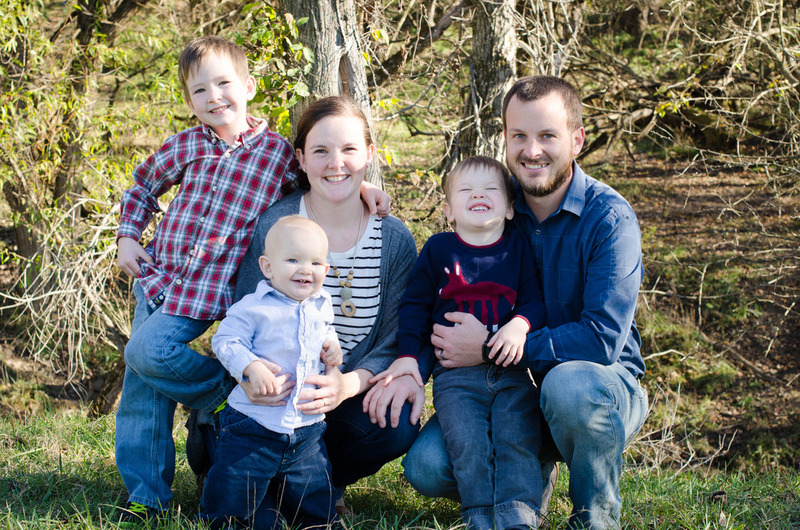 Pre-drill your holes and countersink your screws. Always use glue before you screw the boards together (you don't have to let it dry first), I'm not going to list it in every step, but it's a good idea to glue everything! Be safe, and have fun! Start by using the sides (A) to connect the top and bottom boards (B). The sides will sit in between the top and bottom boards and should be flush with the front, back, and outside edges. Assemble the boards using a Kreg Jig or by drilling through the top and bottom into the side boards. Attach the back board (C). It will sit inside the back opening (at the bottom of the opening) and be flush with the back face of the nightstand. Use a Kreg Jig or drill through the sides and bottom into the back board. Assemble the base. 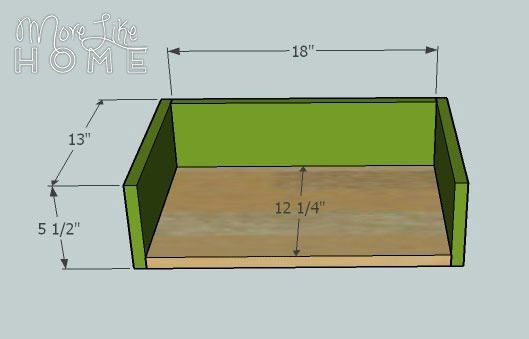 Use the front/back base boards (E) to connect the side base boards (D). Keep the top and outside edges flush. Use a Kreg Jig or drill through the side boards into the front and back boards. Attach the base to the bottom of the nightstand using a Kreg Jig or by drilling down through the bottom of the nightstand into the base boards. Make sure the shorter boards are facing front and back with the taller boards on the sides. The base should be set back 1" from the front and centered with 4" of space on either side. Install the shelf (F) using a Kreg Jig or by drilling through the side and back boards into the edges of the shelf. 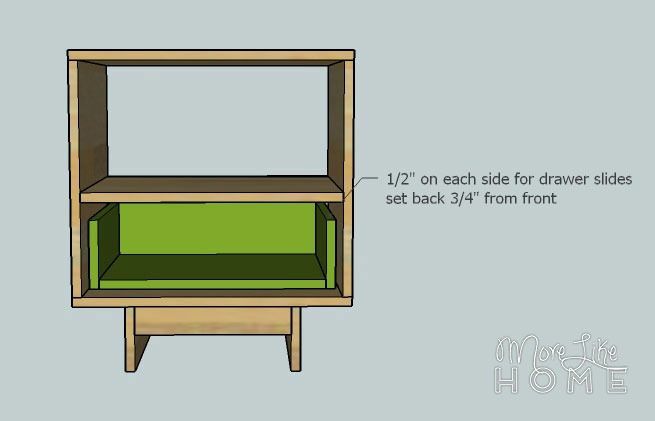 The shelf should be set up 7 1/2" from the bottom of the cabinet, leaving a 10 1/4" space above (which should make the top of the shelf flush with the top edge of the back board.) It sits inside the back board and is flush with the front face of the nightstand. 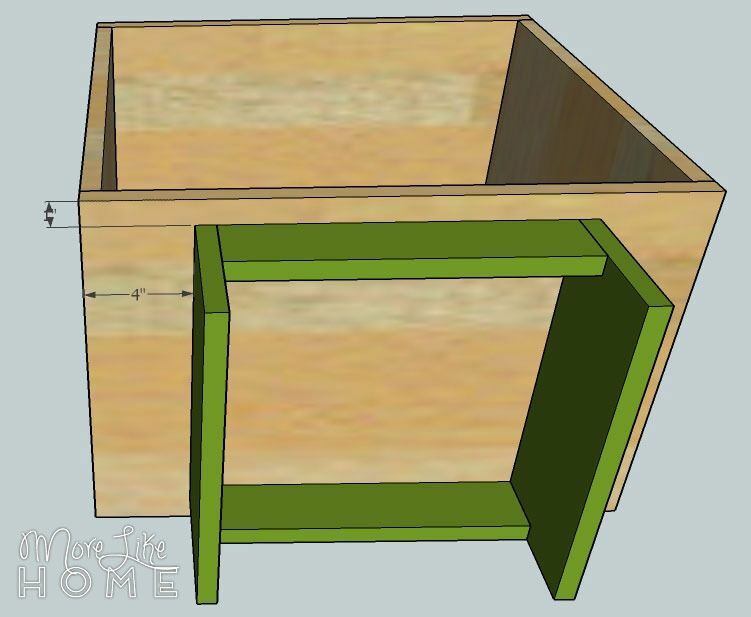 Attach the drawer back (H) to the back edge of the drawer bottom (G). 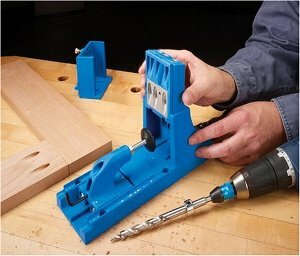 Use a Kreg Jig or drill through the back into the drawer bottom. Then attach the drawer sides (I), keeping all the edges flush, with a Kreg Jig or by drilling through the drawer sides into the drawer back and bottom. Double check the opening of your nightstand first. Most drawer slides require the drawer box to be 1" narrower than the opening. Follow the instructions on your drawer slides to install the drawer box. 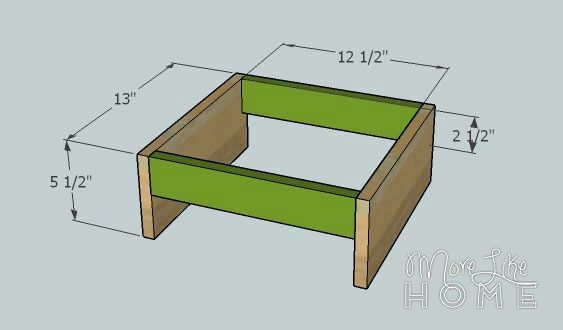 The box needs to end up recessed 3/4" from the face of the nightstand so your drawer front will end up flush in the next step. 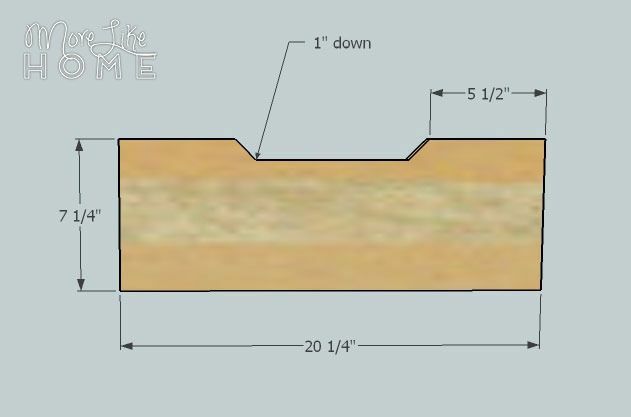 To make a notched drawer front (as shown in our plans) start by measuring in 5 1/2" from each side of the drawer front (J). Mark a notch 1" down in the center space between those marks. You can angle in the ends of the notch as I've drawn it, or keep them straight. If you plan to use a drawer pull, omit the notch and attach it instead. Center the drawer front over the drawer box with a 1/8" gap all around. 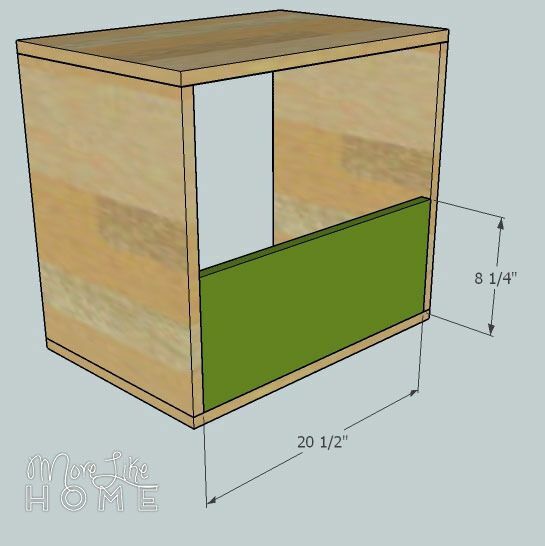 Use finishing nails and glue to attach the drawer front to the drawer box. It may help to trace the drawer box on the face of the drawer front first so you have an idea of where to nail. Once the drawer front is secure enough, I like to remove the drawer and reinforce the drawer front with my Kreg Jig. This will give you the finished look of my original drawing and the first inspiration photo. Alternatively, you could create a two-drawer look to match the third inspiration photo. 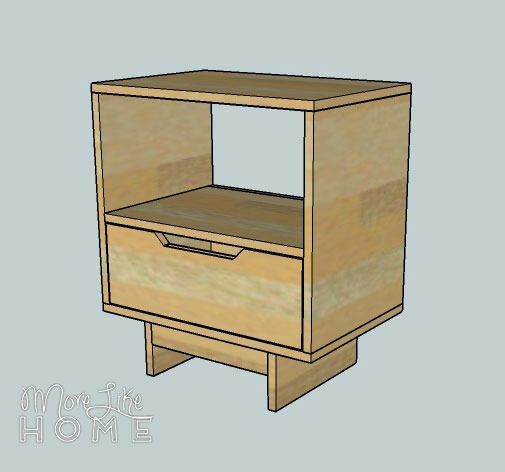 Since such narrow drawers wouldn't be practical, this is a faux front for a larger drawer that uses the regular drawer front (minus the notch). Mark a line along the center of the drawer front from side-to-side. Then set the blade of a table saw (or circular saw if you can cut a very straight line) to 1/8 - 1/4" high. You want to cut a shallow groove in the drawer, but not cut all the way through. Cut along the line you marked. The groove will give the look of two drawers, but you'll still have the function of one drawer. 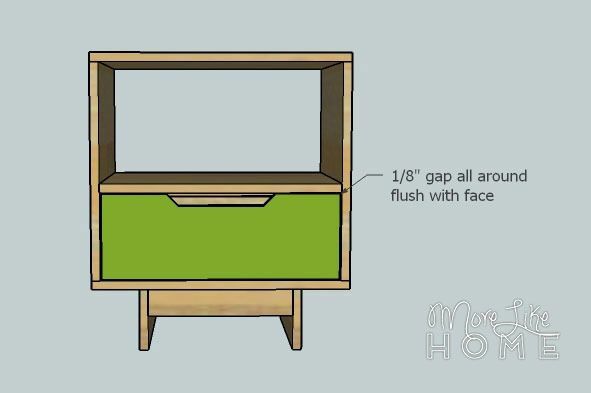 To finish the look add two drawer pulls, one on each of the two narrow "drawer fronts". Once the building is done, all you have to do is finish it! Start by filling any holes with wood filler. Let it dry, then sand it smooth (repeat if necessary). Then sand the whole table smooth for a great finished product (a good sanding can be the difference between looking professional vs. crafty). Then finish with any paint or stain and polyurethane you like. 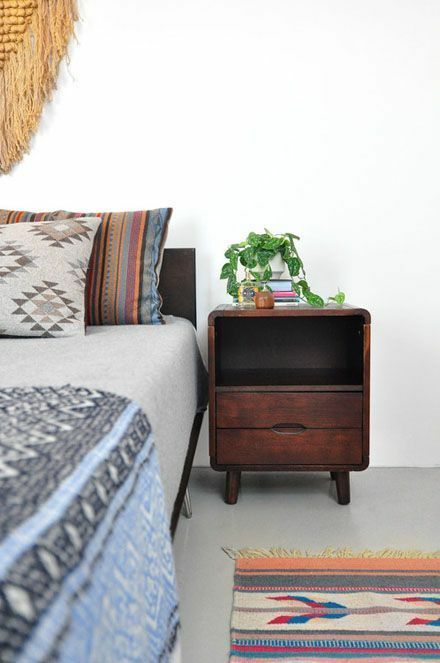 We still have four more days of DIY nightstands coming up. 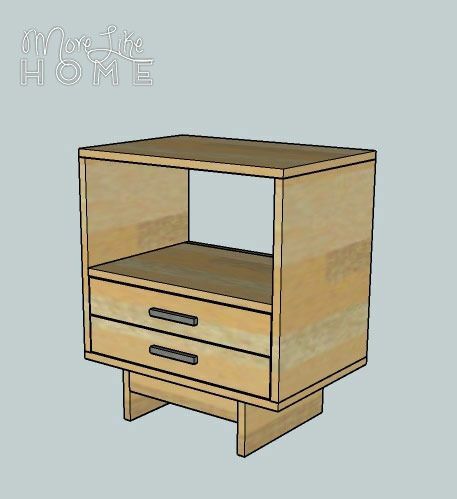 Tomorrow we'll be sharing another mini dresser option, this time in a classic style!